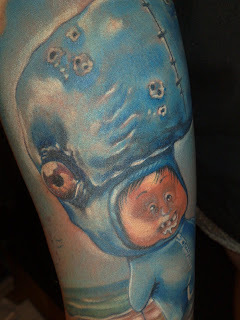 Patrick Morgan: Whaleboy Tattoo in Germany!!!! This is my space to share stuff from my sketchbook among other things, on a regular basis. Check back often, to see what's new! 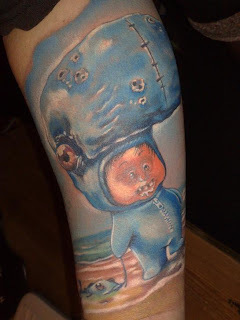 This guy contacted me from Germany saying how funny he thought this pic of Whaleboy is that Bobby Chiu did of our character a while back and tattooed it on his arm. How cool is THAT!!!!!!!! Haha wow! That's pretty cool. Whaleboy is now part of a humans flesh. Looking forward to hear your band tonight. Wow! its looking great.... amazing blog post.... Thanks very much! I love tattoos and i just want one in my hand but I can't do that because is gonna be hard to find a good job. Great stuff from you, man. I would like to appreciate the effort that you have put in making such an informative blog. I enjoyed this post of yours and I must say that every time I come back to your blog, I always have something new and informative to read. Cheers. CLICK HERE TO GO TO MY STORE AND BUY THESE BOOKS!